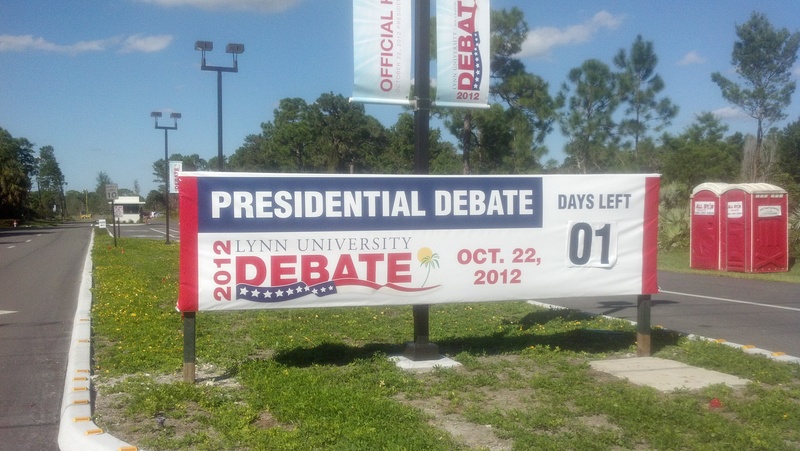 Yesterday, we drove over to Lynn University in Boca Raton, the site of tonight’s third, and thankfully final, presidential debate. By 2pm on Sunday, the University was abuzz with activity, and obviously under full security lockdown. Although we wanted to grab a couple of pictures from the main entrance on Military Trail, it was obvious that security was turning us gawkers away. We turned around and headed for the side entrance on Potomac where we found several people milling around the big debate sign, taking pictures. We grabbed a couple of shots too…a few with our faces in them (you guys who know us saw us on Facebook, but I will just post the generic sign here). We needed pictures you know, just because this is an historical event that is happening in our backyard. If signage is any indicator of who is going to get the BIG JOB, then Obama had better start working on his notes for his first post-presidential speaker’s tour, because Romney/Ryan have him out-done, hands down. Everywhere you look you see Romney signs – some big and some small…everywhere. Signs Signs Signs. Obama, well not so much. There are a few Obama signs of course, here and there, but if I might offer a suggestion, get some bigger lettering on those signs Obama (or if you aren’t ordering them yourself, tell your sign-ordering-guy that you have to compete with the Romney/Ryan signs). The second item of note was a giant Caterpillar tractor, which was loaded on a flatbed semi truck. The Caterpillar tractor was beautifully painted, with Romney/Ryan on the giant blade. Now I did not see who sponsored this big rig. But the message was clear – a Romney/Ryan administration would help spur the construction industry. Ok, if you don’t smell something wrong here, then you haven’t been following the career of Mr. Romney too closely. Then his blimp crashed. Yes, the Romney blimp. The Romney blimp was designed to bear the biggest Romney/Ryan sign of all – to fly it high over the vulnerable and coveted voters of South Florida. But there was too much wind for it I guess –wind that was blowing hard from the ocean side of the state, pushing the giant expensive Romney/Ryan blimp too far to the west. We saw it coming in over our house in Deerfield at about 900 feet, and I mentioned to my wife that it seemed to be drifting west – toward the Everglades. Later we heard they made an emergency landing. Thankfully, nobody was injured. But I wonder if it could be an omen – maybe a sign of things to come. Maybe the man with maximum signage will go down in a (soft) emergency landing on Election Day. Thanks for your on the scene report Trop. Our friend Mitt will be blowing a lot of hot air tonight. He probably was practicing a little too hard this afternoon and the baloon got overinflated. My only regret is that he was not in it as it headed toward the Everglades.Not that I wish him harm but it would be nice if the baloon is a symbolic rrepresentation of old Mitt drifting away on election day,as you suggest.